Components used on a space mission must be cleaned meticulously. Fraunhofer researchers designed a cleanroom for the ESA (European Space Agency) in which the most infinitesimal contaminants can be removed. These experts, together with partners, are sterilizing ESA's "ExoMars" Mars rover, scheduled for launch in 2018. Space missions are inextricably linked to tremendous costs and great risks. The numerous aborted projects lend proof to this fact. Since an unmanned space probe, once started, can no longer be repaired, it is imperative that no part or assembly fail. All the effort would otherwise be for naught, and scientists would have to wait several years for a replacement mission. Contaminants play an important role. Because dirt can block mechanisms, cause a short or disrupt the electronics. Things start getting especially tricky when a probe is supposed to look for traces of life on a distant planet − which is precisely the agenda for the "ExoMars" European Mars Mission, scheduled to launch in 2018. A Mars lander will set down on our neighbor planet and then launch a rover about the size of a car by automaker smart. To ensure its sensors operate reliably as they search for signs of life, the mission must avoid introducing any organic material from earth. 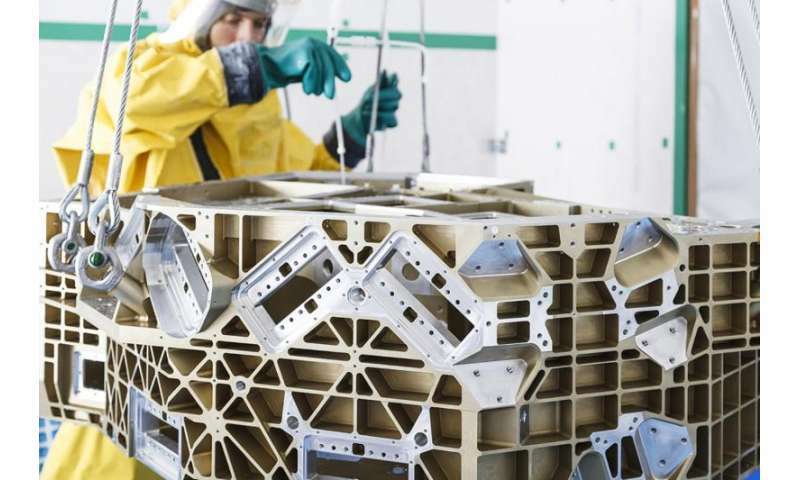 On behalf of the European Space Agency, ESA, the research team at the Fraunhofer Institute for Manufacturing Engineering and Automation IPA is working assiduously to ensure all components are utterly and perfectly sterile, removing even nano-sized contaminants. For its design, the scientists could fall back on the collective expertise at Fraunhofer; indeed, one of the best-equipped cleanrooms in the world is located at Fraunhofer IPA in Stuttgart. To ensure they can sterilize the Mars rover reliably, the experts at ESA drafted the plans for a cleanroom and installed it in the Dutch town of Noordwijk, at the headquarters for the European Space Research and Technology Center (ESTEC). The roughly 70 square meter, sterile-controlled area is sufficient to meet the toughest purity standards, including ISO Class 1. This means that a cubic meter of air may not contain more than ten particles of 0.1 micrometers in size. The ultrasterile section is about one billion times cleaner than the air in the surrounding environment. The design by the IPA researchers encompasses both the planning as well as the layout, quality assurance, realization, certification testing, and operational launch. "We tied together an all-round, no-hassle package, measured the space, decided on the selection of sterilization and cleaning technology, the systems and ventilation equipment, the floor coatings, the filtration systems, and the sterilization equipment, and submitted recommendations to industrial partners who built the space," Dr. Udo Gommel, Manager of the "Electronics and Microsystem Technology" business unit at IPA explains. "For instance, it is important that the floor fits with the walls with respect to its exhaust gas performance. Synthetics isolate destructive exhaust products that might collect on optical lenses, for instance. These contaminants would trigger imaging errors," the engineer and physicist further explains. One process that has proven to be especially effective for sterilizing the Mars rover was developed at IPA and has patents pending. The method originates from the USA, and is used to remove paint from aircraft fuselage. A powerful jet of frozen carbon dioxide (CO2) crystals, about the size of a rice kernel, blasts the paint right off the metal. The researchers made this crude instrument substantially more refined. Instead of CO2 pellets, they use carbon dioxide snow to work on each individual component – from the highly sophisticated aluminum workbench to the ring washers. Here's the rub: the beam that the jet emits is additionally accelerated with a blast of CDA (clean dry air) that encases it. This is how it penetrates into every nook and cranny, removing even the minuscule pollutant. As soon as the tiny snowflakes hit the relatively hot surface, they become gaseous, causing their volume to explosively expand 800-fold. The detonation pressure completely sweeps away every single bit of dust, even fingerprints which the cold gas had just turned brittle. "This approach involves a dry process that does not warp surfaces. When cleaning, these can be gently treated with CO2. That makes it unnecessary to apply heat or chemicals," Gommel says when explaining the advantages of this method. The cleanroom is already operating; the research team is equipping it on an ongoing basis with sterilizer and cleaning technology, and optimizing the flow of material. In addition to the ESA, other national institutions − Thales Alenia Space Italy, an Italian aerospace corporation, for example − are using the facility for their space missions. And still other space agencies like NASA engage Gommel and his team on a consulting basis.